Using her background in electrical contracting and business management, Lucia started Jersey Infrared Consultants in 1984. As President, Lucia overseas all aspects of the company. As the Field Supervisor and Safety Coordinator, Mike is responsible for quality assurance, safety compliance and customer satisfaction. Mike also handles many of the Building Envelope and Roof surveys. Level III Infraspection Institute Certified Infrared Thermographer®#8219. As Office Manager, Sue organizes and coordinates the administative duties and procedures of our office. She is also responsible the accounting department, including accounts receivable and payable, as well as purchasing. Carol uses her experience as a practicing thermographer to provide support in all areas of Jersey Infrared Consultants, including sales and report processing. Level III Infraspection Institute Certified Infrared Thermographer®#5999. Before joining us, Tom directed the Power Quality and Infrared Programs for Consolidated Edison Company. Utilizing his years of on-the-job experience, Tom specializes in Infrared Electrical System Surveys. Level III Infraspection Institute Certified Infrared Thermographer®#3340. Utilizing her years of experience in sales, Beth leads the Jersey Infrared Consultants sales team. As Vice President of Sales, she oversees marketing, trade shows, sales, and training of sales staff. Carol provides administrative and logistical support to all aspects of Jersey Infrared Consultants. As vice president of Operations with over 35 years experience, Mary actively works in sales and oversees daily operations. She is a member of RCI and currently serves on the Board of Directors of teh Metro NY Chapter of RCI. Level III Infraspection Institute Certified Infrared Thermographer®#1391. 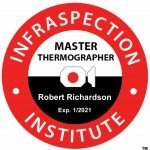 With over 25 years of field experience, Robert is experienced in all Infrared Thermography applications. He has performed thousands of hours of specialized surveys at Petro Chemical sites and surveyed over a million square feet of roofs. Level III Infraspection Institute Certified Infrared Thermographer®#1410. Kevin applies high enthusiasm and a “can do” attitude to every project. Qualified in all areas of commercial and industrial Infrared Thermography, he has performed thousands of hours of electrical surveys. Level III Infraspection Institute Certified Infrared Thermographer® #10901. Jim is a principal and active thermographer for special projects. He handles expert witness services and oversees training. Jim is the Director of Infraspection Institute. Level III Infraspection Institute Certified Infrared Thermographer®#1131. Cindy is responsible for the processing and preparation of all inspection reports. She also support for the other administrative needs of the Jersey Infrared Consultants. Andrew’s experience in all aspects of building construction provides him with great insight as a thermographer. He is a specialist in Infrared Electrical System Surveys and Infrared Building Envelope Surveys. Level III Infraspection Institute Certified Infrared Thermographer®#9748. With over 20 years of field experience, Bob is experienced in all Infrared Thermography applications. In addition to performing thousands of hours of electrical surveys and specialized surveys at Petro Chemical sites, Bob has spoken at various conferences. Level III Infraspection Institute Certified Infrared Thermographer® #6175.